Union goalkeeper Andre Blake watches as Kaku’s penalty shot finds the back of the net during the Union’s loss to the New York Red Bulls on Sunday at Talen Energy Stadium. 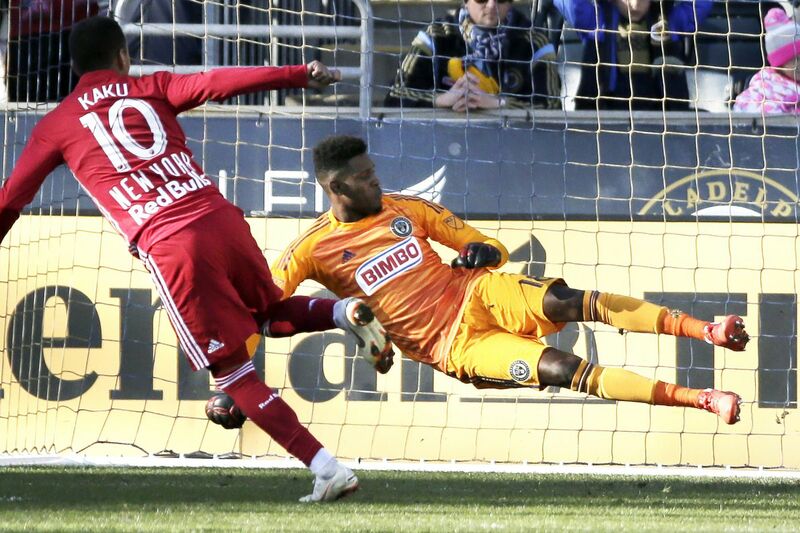 The Union's hopes of hosting their first home playoff game in seven years took a considerable hit on Sunday when they lost to the New York Red Bulls, 1-0, at Talen Energy Stadium. Kaku scored the goal with a 69th-minute penalty kick. Yet the Union (15-13-5, 50 points) remained in fourth place, thanks to other results across MLS, especially Columbus' shocking loss at Orlando. Though the Union enjoyed a 14-8 advantage in shots and 66 percent of the possession, for long stretches, it didn't seem as if they were ultimately going to score. "Some days, soccer goes this way: you can have a lot of the ball, you can feel like you're in control, and then a game-changing play," manager Jim Curtin said. "[The Red Bulls] are the best defensive team in our league, and it's probably not close." The Union's best chance to score in the first half came in the 40th minute, when Fafa Picault collided with Alejandro Bedoya while lining up a shot from the middle of the 18-yard box. The most dramatic moment of the half came seconds before the halftime whistle, when Bedoya slid to block a shot by Kaku and took Kaku out along the way. As the Paraguayan was getting up, C.J. Sapong — already on a yellow card from an earlier foul — shoved him back down. A brawl ensued with almost every player from both teams. Referee Ted Unkel went to the replay monitor and decided not to issue any further cards, a fortunate outcome for all involved. Unkel went back to the monitor in the 67th minute when the replay booth informed him of a handball committed by Bedoya on a Red Bulls (21-7-5, 68 points) corner kick 90 seconds earlier. It was the right call, but it was unusual to see the booth take that long. Kaku stepped up to the spot and scored easily. "It's probably one where if you have a feel for the game, that's why he didn't call it in the run of play, I'm sure," Curtin said. "It kind of ruined a game where a tie would be a fair result." The Union had a good chance to tie the game in the 82nd minute, when they won a free kick in a dangerous spot about 25 yards from goal. Borek Dockal took the free kick and swung it in well, but Red Bulls goalkeeper Luis Robles leaped off his line to punch the ball away. In the 89th, Haris Medunjanin slammed a 20-yard rocket just over the crossbar. We'll find out next week whether that was the Union's last good shot to score at Talen Energy Stadium this season. Orlando shocked Columbus — and all of MLS, frankly — with a 2-1 win that was the Lions' first victory since July 14. The winning goal was a 96th-minute penalty kick by Sacha Kljestan, a player who tormented the Union while with the New York Red Bulls. D.C. United clinched a playoff spot with a 3-1 win over New York City in Washington thanks to two goals by Wayne Rooney. D.C. moved up to fifth place in the East, and are tied with the Union on points. The Union hold the first tiebreaker of total wins. The Montreal Impact beat Toronto FC, 2-0, in Montreal. Columbus' loss kept the Impact alive in the playoff race. Atlanta United beat the Chicago Fire, 2-1, to stay in first place in the East by one point over the Red Bulls. In the Western Conference, Sporting Kansas City beat FC Dallas, 3-0, and overtook Dallas for first place. Los Angeles FC and the Vancouver Whitecaps tied, 2-2. The result eliminated Vancouver from the playoff race, and moved LAFC past Dallas into second place on goal difference — the second tiebreaker. The Portland Timbers clinched a playoff berth with a 3-0 win over Real Salt Lake. RSL remained in sixth place, the final playoff spot, but this was their last regular-season game. They have a bye next week, as one team has to be off because there's an odd number of teams in MLS this year. RSL will thus watch from home as the Los Angeles Galaxy try to overtake them for that last playoff spot. The Galaxy beat Minnesota United, 3-1, to come within one point of sixth place. The Seattle Sounders beat the Houston Dynamo, 3-2, to keep hold of fourth place. The San Jose Earthquakes and Colorado Rapids, both long since eliminated from playoff contention, fittingly played to a scoreless tie in a meaningless game. The only news was that San Jose's Chris Wondolowski remains one goal short of MLS' all-time career scoring record.